A debate between victims over President Ivan Duque‘s controversial refusal to sign off on the country’s war crimes tribunal ended in chaos on Monday. The debate, moderated by far-right Senator Paloma Valencia of Duque’s Democratic Center party, was supposed to discuss the president’s objections to the Special Jurisdiction for Peace (JEP). But the intervention of the controversial founders of the Association of FARC Victims spurred indignation with victims of other armed groups. 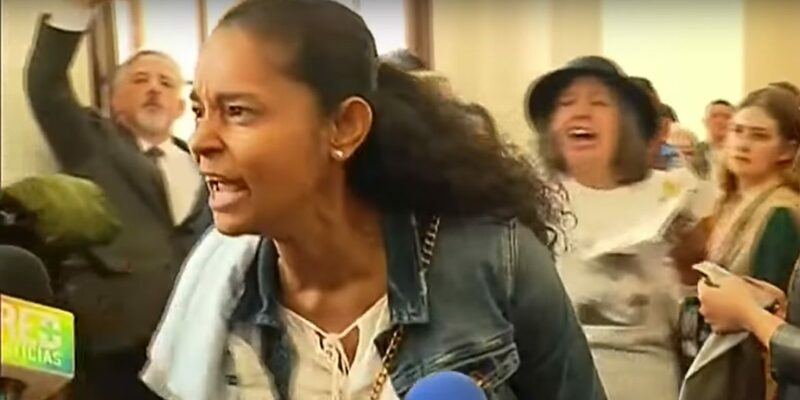 Former Senator Sofia Gaviria (Democratic Center), the leader of a FARC victims association, initially agitated victims by inviting former FARC commander “Olivo Saldaña” to the hearing. Saldaña is a convicted war criminal who also has been sentenced for teaming up with fugitive former Peace Commissioner Luis Carlos Restrepo for faking the demobilization of a non-existent FARC front just before the 2006 re-election of former President Alvaro Uribe. Gaviria’s brother was murdered by the FARC and her family has been ordered to return land they had stolen from victims of displacement. The co-founder of Gaviria’s FARC victims association, attorney Sergio Alzate, ironically accused the JEP of granting funds to victim organizations linked to war criminals at the expense of victims of sexual violence by guerrilla commanders. This triggered a furious reaction from victims and House Representative Angela Maria Robledo (Humane Colombia), who has been promoting the rights of victims of sexual violence for years. While multiple victims of state and paramilitary violence abandoned the hearing in protest, Robledo sought the mediation of Truth Commission President Francisco de Roux in tears in the hope De Roux could intervene. One of the congresswoman’s bodyguards pushed a cameraman of television network Caracol who was trying to film Robledo’s attempt to talk to the Truth Commission president. The hearing continued, but without victims of state and paramilitary violence who represent the vast majority of the conflict’s 8.5 million victims.